When I came home from my last trip to Europe, my purse and luggage were jam-packed with bus tickets, museum maps and assorted memorabilia I couldn’t bring myself to throw out. I already had a photo album for my pictures that wasn’t conducive to scrapbooking and not enough free wall space to clutter up with yet another bulletin board. So the bits and bobs and receipts sat there in my travel purse as months (and then years) ticked by. And then one day I was at the craft store, browsing aimlessly through the paper mache aisle, when I found it: handy little boxes just the right size for filling with trinkets and tickets. They were perfect, but not pretty, so I also grabbed a few sheets of a decorative paper that would look nice with my decor and headed home. But once I finally sat down to tackle my little DIY project, I knocked them out in about 20 minutes. 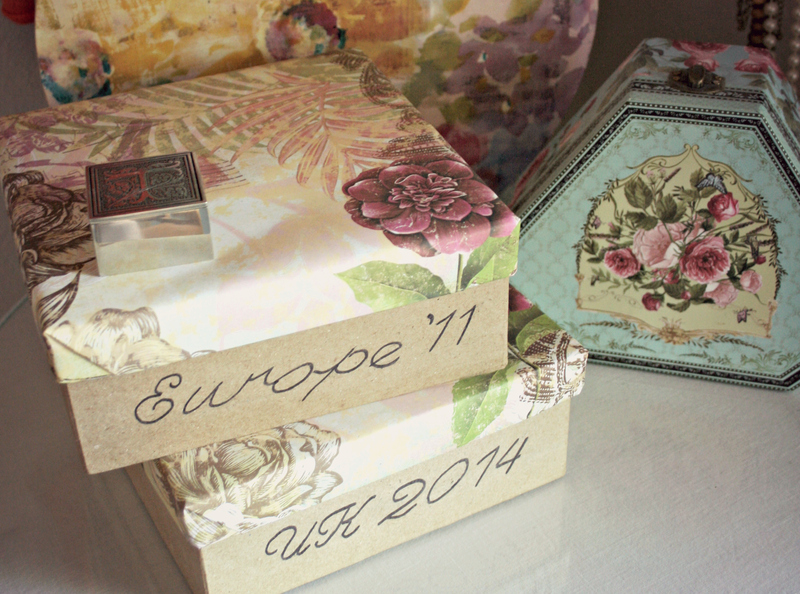 I went ahead and also made a souvenir box for the UK trip I am currently on so that when I get home, I’ll have the perfect place to store all of my treasures, right alongside the last trip’s loot. This easy project is perfect for storing your souvenirs from various trips in a neat, organized and accessible way, but it’s also perfect for creating storage for any other small items. 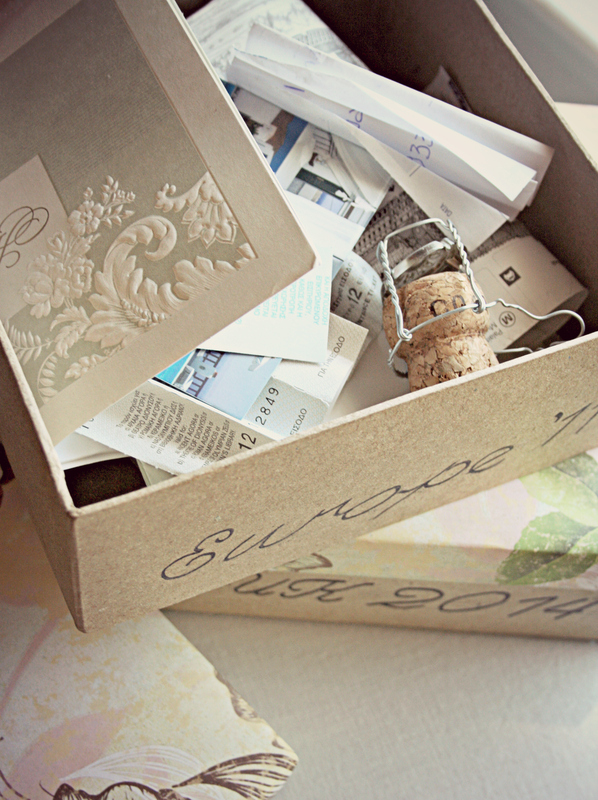 What will you keep in your souvenir box? 1. 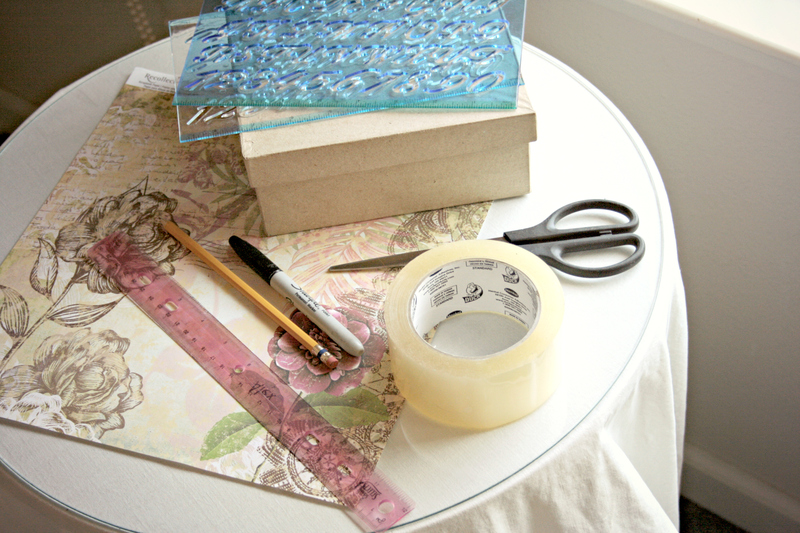 Cut the decorative paper down to a square that hangs over the top of the lid far enough to wrap under the edges. 2. Lay the lid on the cut paper and fold it over each of the edges, just as you would wrap a gift. 3. Cut packing tape to fit inside the lid and tape down each edge of the paper. It’s necessary to use packing tape as regular Scotch tape will not permanently adhere to the paper mache. 4. Place the covered lid on the box. Use a ruler to draw a straight pencil line across what you want to be the front of your box, about an inch and a quarter from the bottom of the lid. Remove the lid. 5. Lay your stencil on the pencil line and lightly trace each letter in pencil. Remove the stencil and go over the penciled letters with black felt tip pen. Erase pencil marks.